BICC Publications/Impact Assessment of the Reintegration Component. You are here: Home » Publications » Impact Assessment of the Reintegration Component. 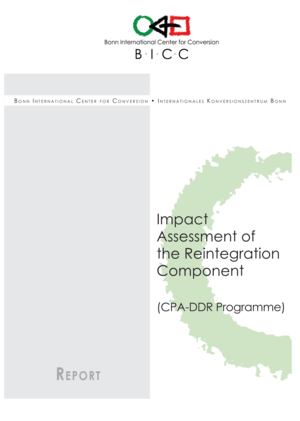 Impact Assessment of the Reintegration Component. The new Demobilisation, Disarmament and Reintegration Programme (NDDRP) in the Republic of South Sudan was launched by the National Demobilisation, Disarmament and Reintegration Commission (NDDRC) on behalf of the South Sudanese government in 2012. A pilot program started in April 2013 and is due to run through to June 2014. The goal of the new program is to demobilize 150,000 combatants between 2013 and 2020, 80,000 from the SPLA and 70,000 from the other organized forces. The overall objective is to reduce the size of the SPLA/SSAF and the other national organized forces, and assist the ex-combatants (XCs) in returning to civilian life and creating sustainable livelihoods. Between 2009 and 2011, a first phase of the DDR program based on the Comprehensive Peace Agreement (CPA) succeeded in demobilizing more than 12,000 combatants under the leadership of the then SSDDRC. The program was implemented in cooperation with UNMIS and UNDP, as well as different implementing partners including GIZ IS and IOM in different parts of Southern Sudan. However, while the demobilization process was largely successful, the program was severely criticized by international donors and other partners for its reintegration component. This stands in contrast to a number of “client satisfaction surveys” done by UNDP as well as by some of the implementing partners which came to the conclusion that at least those XCx who were polled by the surveys were largely satisfied with the reintegration assistance received from the program. When the reintegration phase of the CPA DDR Programme came to an end in December 2012 stakeholders remained deeply divided on whether the livelihood situation of the program beneficiaries had tangibly improved. While some partners have argued that the program was ‘merely’ poorly planned and executed, others have stated that the basic approach (individual reintegration support focusing on vocational training and small business support) was wrong against the background of the socio-economic situation in South Sudan. This was echoed by government officials and the SPLA who seemed to doubt the achievements of past demobilization and reintegration exercises. Given the need to implement a new DDR program on a larger scale, the above-mentioned questions remain of great importance. This evaluation will try to answer some of them and gauge the successes and failures of the reintegration activities undertaken up to the end of December 2012 by the NDDRC and its partner organizations, so as to draw lessons and take them into account in the course of the planning and implementation of future reintegration activities.